An impromptu SPOG night at Tilshead with Jonathan Gale, Patrick O’Donnell and Brian Dudgeon. Jonathan and I arrived at 2130 to set up at dusk before being joined by Patrick and Brian who had met in the pub beforehand. Being only a few weeks from the summer solstice, the sky never got truly dark. The northern horizon remained pale blue superimposed with the silhouettes of the nearby treeline. Despite this, we caught some interesting objects in a variety of telescopes. After aligning the 14” f5 Newtonian on Jupiter, Vega and Arcturus I was good to go. Venus was behind the nearby trees but Saturn was beautiful low down in Scorpius. This was the first time that I had seen it since February’s Winter Star Party. Titan was visible followed by Rhea and the close in trio of Tethys, Mimas and Dione. While in Scorpius, I couldn’t resist the globular cluster M4. I find M4 to be a rather sparse globular but a beautiful sight none the less. The bright space station pass at 2230 was a good chance for a tea break before enjoying the classics: M3, M51, M13, M82 and M57. It was interesting to use the UHC filter slide on M57 as it instantly darkened the pale grey sky to a dark black. Now all I need are dark skies! The irregular galaxy NGC 4449 was enjoyed by all. This object is the Webb Society’s object of the month and it is a fascinating galaxy. It has a central bar and numerous star forming regions visible in the eyepiece. I have submitted my earlier observation so I hope it is published in the next issue. 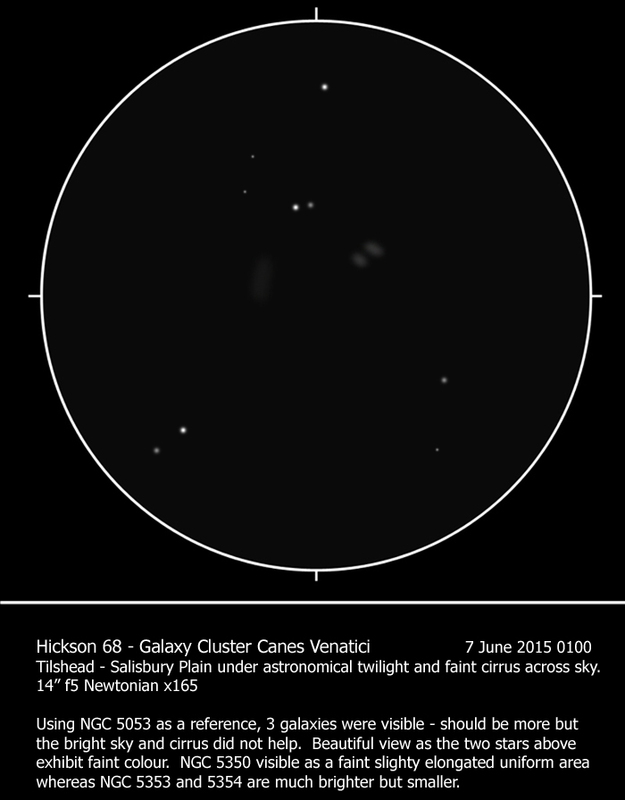 My new object of the night was Hickson 68, a galaxy cluster 90-100Mly away. 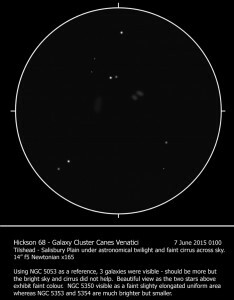 The poor conditions hampered the viewing but the brighter three galaxies were visible. I shall have to return one day and hopefully catch some more. At 0130 ish, the waning moon rose lighting up the cirrus across the sky. While making for a beautiful scene, deep sky observing was now over. The moon is always fantastic in the eyepiece and I was grateful for my tracking. The Altai Scarp and egg-shaped double crater Torricelli were prominent near the terminator. Having studied the lunar surface, it was time for a final brew before packing up. So despite the light skies and thin cirrus we still had a cracking night with views of new and familiar deep sky objects plus the space station, Saturn, Jupiter and the moon. Not bad for June!